Rheedia (named after H. van Rheede 1635- 1691). Guttiferae. Trees, full of yellow sap, some of them with edible fruit. Leaves rigid, leathery, lightly feather-veined: peduncles axillary or lateral, the male fascicled, the female fewer: fls. often small, polygamous-dioecious; sepals 2, often connate at the base; petals 4, decussately imbricated; ovary 3- (rarely 4-5-) celled: berry corticose and indehiscent.—-About 30 species, Trop. Amer. Garcinia (Laurence Garcin, who lived and collected in India, and wrote in the eighteenth century). Guttiferae. This genus includes the mango- steen, which is declared by some connoisseurs to be one of the most luscious of all tropical fruits; also the gamboge tree, whose resinous juice yields a well-known pigment and purgative. 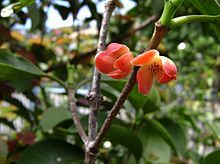 Garcinia is a polymorphous genus of upward of 150 species in the tropics of Asia, Africa and Polynesia. The species are glabrous trees, usually with a yellow juice: lvs. evergreen, opposite or ternate, simple, often thick: fls. solitary or fascicled, polygamous or dioecious; sepals and petals 4; stamens in male fl. many, 2- or 3-delphousj female fls. with staminodia; ovary 2- to many-celled, with sessile stigma and solitary ovule in each cell.—The mangosteen is cultivated in the West Indies; the gamboge tree is also cult, in S. Fla.; it is a broad- leaved tree of slow growth. The mangosteen is about the siz€ and shape of an orange, with a rind of similar thickness and edible segments of form and arrangement like those of an orange. It is brilliantly colored outside with rich purple. The flavor is said to suggest something between a grape and a peach. Numberless efforts are said to have been made to naturalize this tree in the tropics without success. The successful ripening of this fruit under glass may be regarded as an achievement. See Mangosteen. Garcinia madruno (Humb. & Bonpl. ex Kunth) Hammel – ungüento maría, tierra amarillo, "madroño"
w:Garcinia. Some of the material on this page may be from Wikipedia, under the Creative Commons license. This page was last modified on 8 June 2010, at 06:46.